This is the toy accessory set for The Children’s Grocery Store Check Out Aisle. It contains 70 components to enhance the play store including grocer apron, conveyor belt divider, cloth shopping bag, play money, coupons, credit card, two grocery cans and five boxes, and a grab-and-go rack that holds gum, magazines, and more. Ages 3 and up. 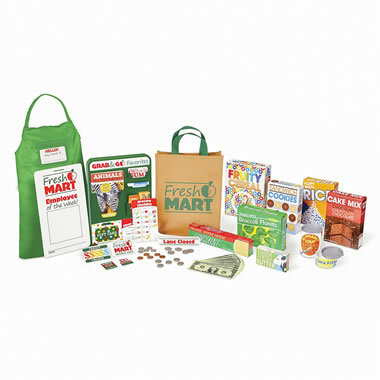 Play Accessories For The Children?s Grocery Store Check Out Aisle comes with The Hammacher Schlemmer Lifetime Guarantee. Items that we sell are guaranteed for their normal life under standard non-commercial use.